We’re a small town business, in the heart of Berthoud Colorado. Berthoud Vintage is a home décor boutique that specializes in vintage inspired products, new, old and handcrafted. We are locally owned and family operated & each item at the shop is hand selected by our owner. Our goal is to inspire you, to make your house truly your HOME. Berthoud Vintage started out as just a hobby in Courtney’s garage, where she had learned techniques from her mother as well as family and friends. In early 2018 her hobby unexpectedly turned into much more. After her mother’s guidance and research, they were able to start a shop in the little town that they loved, Berthoud. Courtney has always been creative & loved interior design for her own home, but never saw herself making a living doing those things. Throughout most of her life, Courtney has always known she wanted to start a business in the little town she had grown up in, she just really didn’t know what. She was trying to find something that would allow her to be creative and also something that people would actually be interested in. Her mother, Amy, has always loved decorating her home, and Courtney saw that as creative and something she would love to get in to. With her families support, she found the perfect space in the heart of Berthoud. It was a lot of hard work and long nights, and within a MONTH Berthoud Vintage was started. She knew it was a long shot but had a gut feeling, she was on the verge of something amazing! 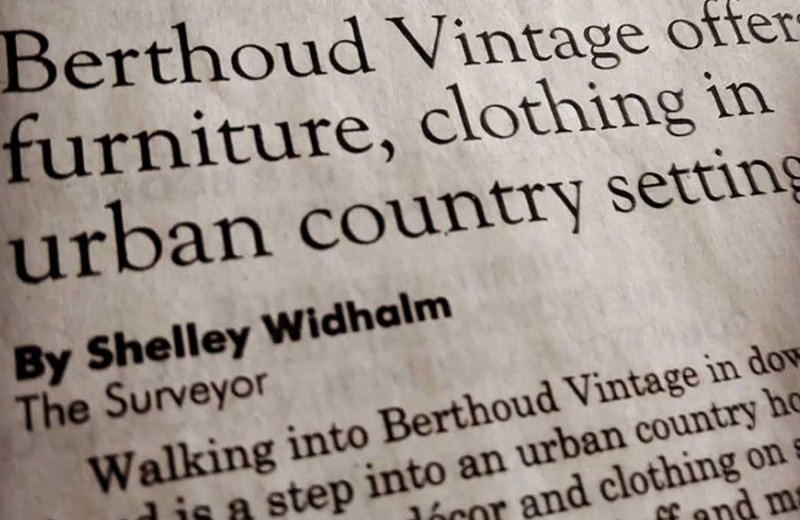 Berthoud Vintage opened its doors on March 24, 2018 and it has been welcomed with kindness of the small community she had so longed to work in. Sign-up & Enter a Chance to Win! Enter your information to be added to our preferred email list to receive first opportunity of sales and events. When you subscribe you will be added to a monthly drawing of a $25 gift Certificate! Beautiful and unique pieces at super reasonable prices! The staff is friendly and helpful and it smells of lavender when you walk in, there’s buckets of dried lavender, essential oil, candles, mmmm it smells so good!! And it’s constantly changing so you won’t just find the same old stuff every time you go in! A beautiful shop, we’ll staged w a wide variety of home goods. The prices are very affordable. So glad they’re in Berthoud! I now make almost weekly stops to see their ever changing inventory! This store is adorable! Bought a beautiful table for our guest bedroom as we needed something for under the TV and it looks fantastic! Berthoud Vintage has lots of beautiful items all one of a kind! What a great perk to Berthoud! Absolutely a fabulous little niche much needed in Berthoud. Great prices friendly and just quaint. Fantastic addition to our town! Can’t wait to go back!!! !